The Furka Base Tunnel is a Swiss railway base tunnel on the Matterhorn Gotthard Bahn's Furka–Oberalp line, a west-east railway connecting the cantons of Valais and Uri. Its west portal lies east of Oberwald (VS), at 1,390 m (4,560 ft) above sea level and its east portal lies south of Realp (UR), at 1,550 m (5,090 ft). 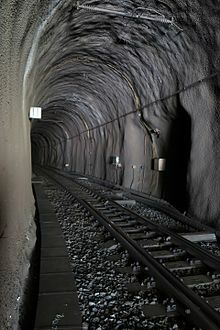 The base tunnel is 15,407 m (50,548 ft) in length, and replaced the previous track that climbed to an apex of 2,160 m (7,090 ft) above sea level, thus allowing year-round service through service on the Furka–Oberalp line. The old line has been reopened by the Furka Heritage Railway for tourist trains which pass the Furka Pass via the 1.8 km (1.1 mi) long Furka Summit Tunnel. In the middle of the base tunnel, is a small access tunnel from Bedretto in the canton of Ticino (1,480 m (4,860 ft)). 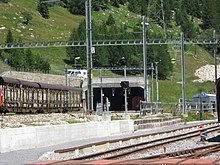 The Furka Base Tunnel is completed by a bypass tunnel around Oberwald. Prior to the opening of the base tunnel, the high-level route closed during the winter months because of heavy snowfall, and large sections of the overhead electrical lines had to be dismantled. In 1976, the Parliament of Switzerland passed a bill for its construction, sponsored by Roger Bonvin, following an initial cost estimate of 76 million francs despite difficult geology. The construction costs, however, had been deliberately lowballed to procure parliamentary support, and quickly rose to exceed 300 million Francs. The political fighting surrounding the cost overruns are said to have contributed to Roger Bonvin's ill health toward the end of the project and he died just before its opening in 1982. A plaque commemorating Roger Bonvin is installed as the base tunnel's entrance in Oberwald. In its initial year of operation, the base tunnel was used to transport more than 75,000 passenger cars, trucks and buses. Currently, it also serves both an hourly regional train and ten daily Glacier Express trains between Zermatt and the ski resort town of St. Moritz. During the winter skiing season, traffic in the tunnel consistently approaches maximum capacity. ^ Eisenbahnatlas Schweiz. Verlag Schweers + Wall GmbH. 2012. p. 34. ISBN 978-3-89494-130-7. ^ Wyss, Max (2019/03/05). Comment on Levy, Alon (2019/03/03). "Why American Costs are So High (Work-in-Progress)". Pedestrian Observations. "Switzerland had its famous example: the Furka base tunnel (part of the Glacier Express route). Its costs were deliberately downplayed, because otherwise, the project would not have passed parliament."